There is a saying in my community that you can’t know where you are going unless you know where you have been. The National Museum of African American History opened this weekend in Washington, DC. after many years of hoping, planning and preparation. I haven’t visited the museum yet, but I can’t wait to get there. Meanwhile, I am left to my own memories and reflections. Such reflections inspired my quilt Strength From My Ancestors. Take a moment to honor your heritage and move it forward. First Lady, 28×42 inch art quilt by O.V Brantley, 2016. Each August my life is filled with joy and gratitude as my friends and I host the Atlanta Quilt Festival. The 2016 edition of the Atlanta Quilt Festival ended yesterday. By all measures it was a huge success. Thank you for your support! From the standing room only opening reception to sold out classes, trunk shows and workshops, participation exceeded all expectations. More people than ever visited the exhibit. I had several quilts in the exhibit, but the new one you could not have seen before the Festival is First Lady. If you did not get to see it in person, enjoy! Here are the other quilts I had in the exhibit at South Fulton Arts Center. Give Yourself a Dream Flower, 38×40 inch art quilt, by O.V. Brantley, 2016. For sale at ovbrantleyquilts.com. Disagreement, 36×48 inch quilt by O.V. Brantley, 2016. Give Yourself a Flower Garden, 60×60 inch appliqué quilt by O.V. Brantley, 2016. Star of Mu, 60×60 inch quilt by O.V. Brantley, 2016. My Give Yourself Flowers series of quilts is intended to remind me (and those who love my quilts) to always be good to myself. Too often we wait for others to make our lives magical. I say it is my responsibility to make my life magical. Lest I forget that lesson, I have added two magical flower quilts to my collection. They are Give Yourself a Dream Flower and Give Yourself a Wild Flower. Both are listed for sale in my studio store. Quiet time is so important. Each morning I try to set aside some time to center myself. I reflect on the things for which I am grateful. I try to dig deep to find my best self. I analyze pros and cons to try to make the best decisions. My quilt Sunday Morning is intended to capture those moments in my life — quiet, calm, deeply thoughtful. Do you make time for quietness in your life? Blue Heart, 44 x 52 inches, by O.V. Brantley, 2012. Assistant DeKalb County Attorney Bennett Bryan argued a case on behalf of the DeKalb County Tax Commissioner before the Georgia Court of Appeals. This was no ordinary argument however. The Court was sitting at the University of Georgia where Bennett received his law degree. I am sure it is an experience that Bennett will never forget, but to make sure he never forgets, I gave him my quilt Blue Heart to mark the occasion. Bennett Bryan and O.V. Brantley with “Blue Heart”. My quilt Getting Stronger and Stronger started out as a demonstration quilt so that I could demonstrate hand quilting at the 2015 Atlanta Quilt Festival. Now that I have finally finished it, I really like it. The color combination is symbolic of a fight against breast cancer. It seems we all know someone who is battling this terrible disease. The pink and brown colors represent vulnerability and strength. The finished beauty of the quilt (complete with big stitch quilting) represents glorious victory. This quilt makes me happy. Enjoy! Getting Stronger and Stronger in the quilting frame at 2015 Atlanta Quilt Festival. African Star, 68×68 inch quilt by O.V. Brantley, 2016. My quilt African Star was with me for a very short time. After one of my friends got a new job, I decided African Star was the perfect gift for her. She says it matches her bedroom perfectly. I love star quilts and the symbolism they represent. This quilt is one huge star as is my friend. My collection of red and white quilts are part of an exhibit entitled Looking Forward and Backward: The View From My Grandmother’s Porch. The exhibit is at the Atlanta Fulton County Library, 126 Carnegie Way, Atlanta, GA 30303. It will be on display until April 29, 2016. In addition to my quilts, Aisha Lumumba, Marquetta Bell Johnson and Elaine Parker also have quilts in the exhibit. Their talent will amaze you! Our styles are so different that I am sure you will find a lot to enjoy. We had a large crowd at the Opening Reception Thursday. Guests enjoyed entertainment by Felton Eaddy and Pamela Diana and cupcakes by India’s Sassy Sweets. We also shared our stories with the audience. Please visit ovbrantleyquilts.com for purchase information. Use coupon code “library” for an extra 10% off until May 1, 2016. Of course, some of my red and white quilts like Star of Mu shown above are precious heirlooms and are not for sale. I hope you will be able to see the exhibit. Here is a small sampling of my collection I See the World in Red and White and Joy! Ancestral Delta Star, 68×68 inch quilt by O.V. Brantley, 2016. Dreaming of Being the Belle of the Ball, 50×58 inch quilt by O.V. Brantley, 2016. Give Yourself Flowers Today, 16×21 inch quilt by O.V. Brantley, 2016. Red and white quilts waiting to be hung. Audience enjoying entertainment at “Looking Forward and Backward: My View From My Grandmother’s Porch” exhibit. I just returned from a fabulous vacation cruising on the Celebrity Equinox for 11 nights. My gratitude meter is sky high! 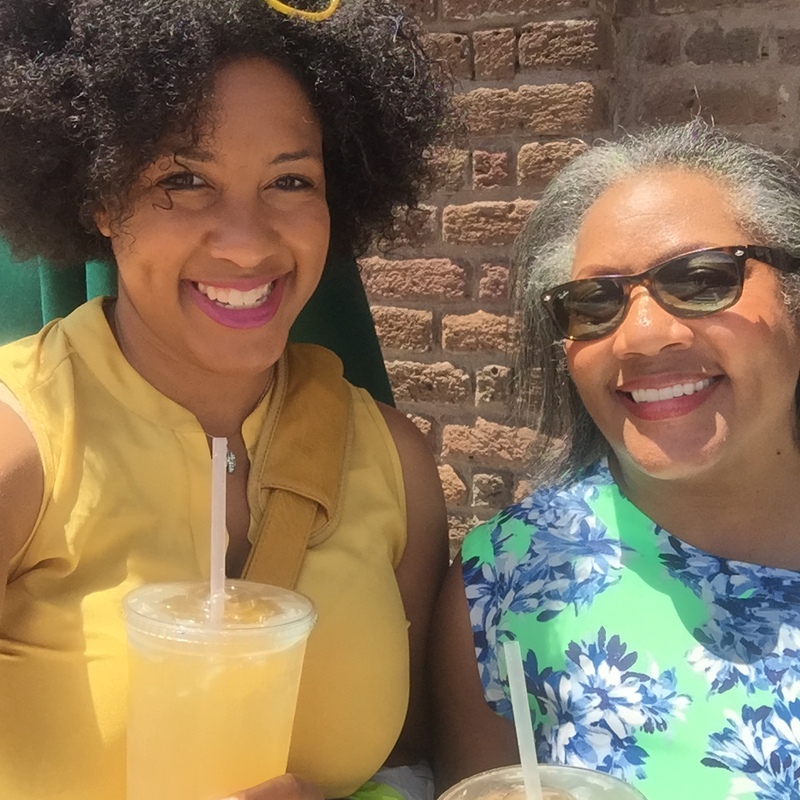 I enjoyed great food, interesting ports of call, fabulous fun with my travel mates and uninterrupted Mommy time with daughter India. The highlight of the trip for me was visiting South America which had long been on my bucket list. 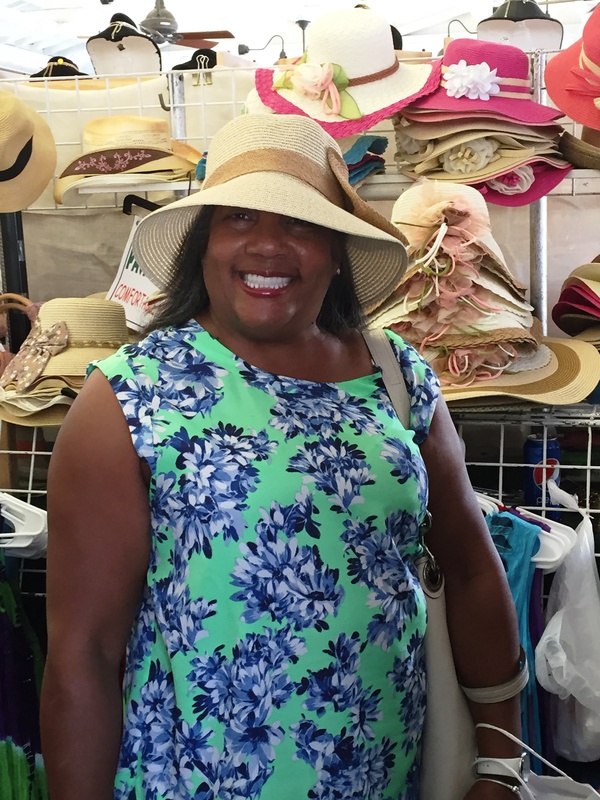 We spent two glorious days in Cartagena, Colombia, but also visited Cozumel, Costa Rica, Panama and Grand Cayman. Part of the joy of visiting that part of the world is the sheer beauty of it. One of my strongest memories of this trip is that flowers seemed to be everywhere. 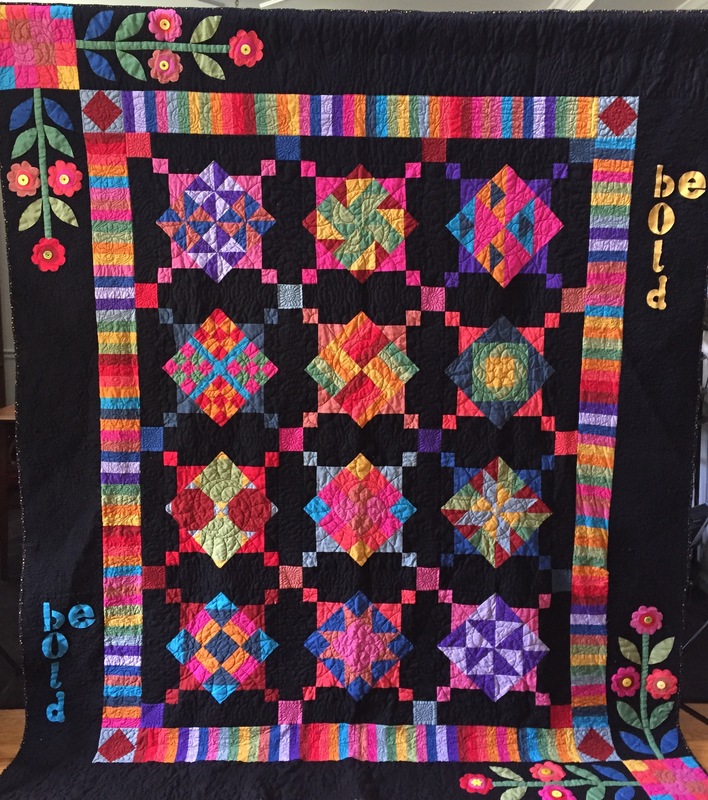 While I will hold those colorful memories close to my heart, if they begin to fade, I can always turn to my quilt Give Yourself a Flower Garden for a memory jolt of just how good life is. When was the last time you checked something off your bucket list? My Southside Neighborhood, 63×81 inch art quilt by O.V. Brantley, 2014. Just before the official beginning of spring, we all get the urge to clean up something. We tackle the yard and haul away dead branches. We tackle our closets and donate clothes we have not worn in years. We reorganize our offices and resolve to be better organized. But what about people? Are we brave enough to discard the negative people in our lives? Are we committed to finding a new job or a new relationship? Remember there is no room for the new until you throw out the old. What are you throwing out to make room for something new? Are you making your life as green and vibrant as my quilt My Southside Neighborhood? Honor those who came before. Dream like crazy about what comes next. But above all, enjoy the journey! My quilts and I wish you a Happy Black History Month! From Africa To Atlanta By Way of Arkansas, 72 x 72 inches, by O.V. Brantley, 2004. My personal Black History Month Memory Quilt. I have learned that I am happiest when I am me. (It sounds like a dumb statement, but many people spend a lot of time trying to be someone else). My resolution for 2016 is to continue to be me. That means I will continue to share my beautiful quilts. I will continue to enjoy the rough and tumble of my local government law practice. I will continue to try to be the voice of reason in the room as my mediation skills teach me to do. I will continue to try to be Super Mom and dote on my now grown-up daughter. I will continue to try to be the Best Boss, the Best Friend, the Best Aunt and the Best Grandmother to my dog Justin. All of that rolled up together is me. Be happy in 2016 being you! Serene at Sixty, 38 x 42 inch quilt, by O.V. Brantley, 2014. Each year on the first Saturday in December, I host a brunch for 20 of my closest quilting friends. We call it the “Fabric is Better Than Food Brunch”, and this tradition has lasted for 15 years. Each year one of the quilters issues a challenge for the next year and gives each quilter one or more challenge fabrics that must be used in the quilt. This year’s challenge was to make a scrap quilt that included two challenge fabrics. Scrappy Treasure was my answer to the challenge. Counting from left to right, the challenge fabrics are # 15 and #26. Scrappy Treasure is listed for sale in my Studio Store at Etsy.com/shop/ovbrantleyquilts. Visit O.V. Brantley Quilt Studio on Facebook to see pictures of the amazing show and tell at the brunch. Flowers Hoping to be Free, 75 x 75 inch quilt, by O.V. Brantley, 2005. After the Christmas trees are decorated and the stockings are hung, out come the Christmas quilts to take center stage. I try to add to my collection as often as possible. I love Christmas! A Child’s Christmas, 45 x 45 inches, by O.V. Brantley, 2003. Santa’s Secret Weapon, 39 x 54 inches, by O.V. Brantley, 2007. Merry Christmas, 36 x 36 inches, by O.V. Brantley, 2002. African Christmas, 65 x 75 inches, by O.V. Brantley, 2004. Several of my holiday quilts added to the festive atmosphere in the DeKalb County Law Department this holiday season. Staff and guests at our annual Holiday Open House always enjoy the quilts. Joyful Butterflies, art quilt by O.V. Brantley, 2015. Each year on the second Saturday in November, my neighbor Connie Marshall and I open her home to friends who collect our creations. Connie makes jewelry. I make quilts. This year was the best ever. Attendance and sales exceeded all expectations. Below are some of my quilts that went home with new owners. Connie and I thank you for being so supportive. See you next year on November 12th! Let’s Pull Together, 31 x 32 inches, by O.V. Brantley, 2009. Heaven’s Highway, 25 x 27 inches, by O.V. Brantley, 2009. I Believe in Angels #20, 30 x 37 inches, by O.V. Brantley, 2011. A Woman of Sophisticated Substance #3, 26 x 24 inch quilt, by O.V. Brantley, 2013. Happy Alone, 11 x 18 inches, by O.V. Brantley, 2010. A Woman of Sophisticated Substance #8 art quilt by O.V. Brantley, 2015. Life is Good, 72 x 84 inches, by O.V. Brantley, 2002. My Southside Neighborhood, 66×81 inch quilt by O.V. Brantley, 2014. I am a big believer in vacations. Why? First, because they are educational. I never fail to learn something new on vacation. Second, because they free your mind to re-imagine things. Third, because they increase my gratitude factor. I am never so grateful for all the things I have at home as when I return from vacation. India and I just returned from an amazing 10-day vacation in Italy. We traveled from Milan to Florence to Venice with many stops in between. We learned. We reimagined. We were grateful. Woman’s Work is Never Done, 36 x 62 inch art quilt by O.V. Brantley, 2014. For sale at Lucy Craft Laney Museum of Black History until 12/31/15. Four of my quilts will be part of the Brown Sugar Stitchers exhibit at the Lucy Craft Laney Museum of Black History, located at 1116 Phillips Street in Augusta, GA. They are Woman’s Work is Never Done, Three Sisters, Give Yourself Flowers Growing Free, and Joyful Journey. The exhibit opens October 4th and closes December 31st. If you are in the Augusta area, it’s worth a visit. 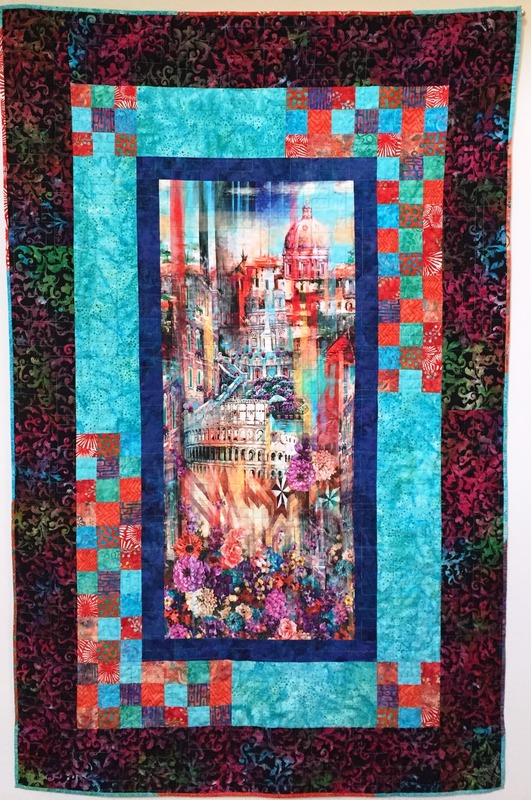 Three Sisters, 38×58 inch art quilt by O.V. Brantley, 2015. For sale at Lucy Craft Laney Museum of Black History until 12/31/15. The 2015 Atlanta Quilt Festival, my personal labor of love, was the best ever! The exhibit showcased over 100 quilts. We had more classes than ever before, and they were led by nationally known teachers. We had large crowds, great PR from the Atlanta Journal and the exhibit was showcased a month rather than the two weeks it lasted in previous years. I am so grateful to all my old friends (especially those who serve on the Clara Ford Foundation Advisory Board and the members of the Brown Sugar Stitchers Quilt Guild) and new friends who believe in my dream and come along for the joyful journey. 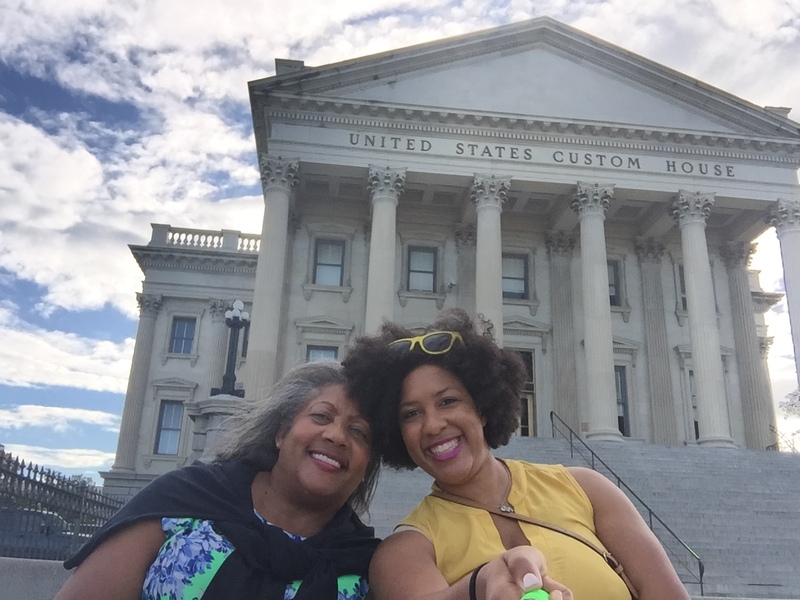 I am grateful for the new things I learned from the amazing workshop leaders — Joy Peters, Latifah Shakir, Nina Moore, Cookie Patterson and Gyleen Fitzgerald. I am grateful that Holly Anderson, certified quilt appraiser, was able to tell me how much my quilt is worth and that Hammonds House Museum continues to be my partner. The 2015 Atlanta Quilt Festival has truly been a month long joyful journey. So today I am sharing my newest quilt called Grateful Journey. It is listed for sale in my ETSY Studio Store. Do you have something in your life that you do purely for the joy of it? I hope so. If not, share my joy each August as I celebrate my love of quilts. Swimming Upstream #1, 16 x 31 inch art quilt, by O.V. Brantley, 2010. Swimming Upstream #1 found a new home and has been shipped to her new owner. I know she is gone to a home where she will be loved. You can view the other quilts available for purchase in my ETSY Studio Store found at http://www.etsy.com/shop/ovbrantleyquilts. My Swimming Upstream series reminds us to enjoy the beauty of the journey even during the tough times. Fall is my favorite time of the year. I love the leaves. I love the sparkle in the air. I love football! This quilt entitled Football Saturday captures all my loves. Blue Moon Over Africa, 50 x 52 inches, by O.V. Brantley, 2010. Blue Moon Over Africa found a new home and has been shipped to California. I know she is gone to a home where she will be loved. Blue Moon Over Africa celebrates the unique and rare things that happen in our lives. 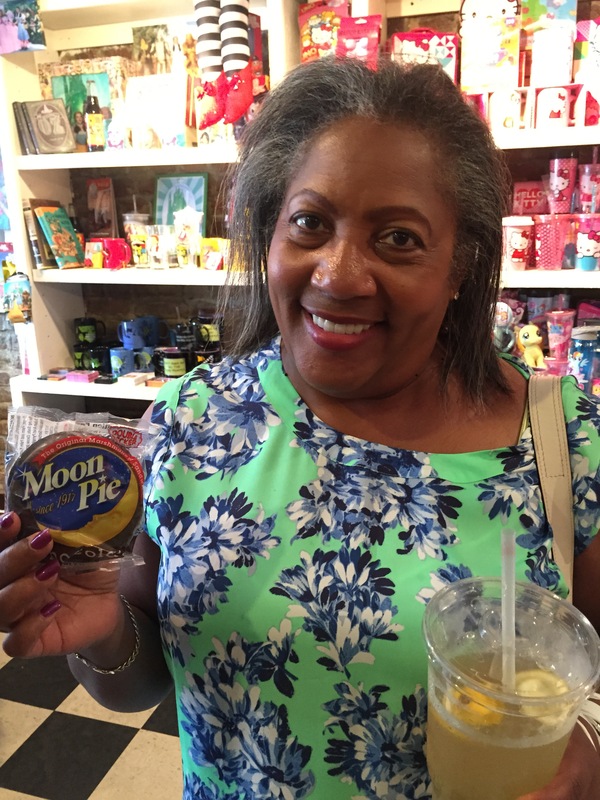 I hope you are having a blue moon kind of day. When India and I travel, I try to document the trip with a quilt. That way, we have our mental memories and a tangible memory that we can touch. Last summer, India and I spent a magical weekend in Rome before joining a group of friends to board a cruise ship to sail around the Mediterranean. We felt so brave. Even though we did not speak the language, we rode the subway, visited all the major tour destinations, shopped in beautiful stores and ate delicious food. A year later, we often talk and laugh about our adventures. Now this quilt will add to the memories as it hangs in our home. Vacations are important. Did you find time to make memories this summer? If not, it’s not too late. I Believe in Angels #11, 33 x 32 inches, by O.V. Brantley, 2011. I Believe in Angels #11 found a new home at the Quilt Market during the 2015 Atlanta Quilt Festival. I know she is gone to a new home where she will be loved. My quilt Three Sisters is part of the 2015 Atlanta Quilt Festival exhibit at South Fulton Arts Center through August 31, 2015. Visit the center located at 4645 Butner Road, College Park, GA Monday through Saturday from 10 – 4 p.m. to see this quilt in person. It is listed for sale in my ETSY Studio store. 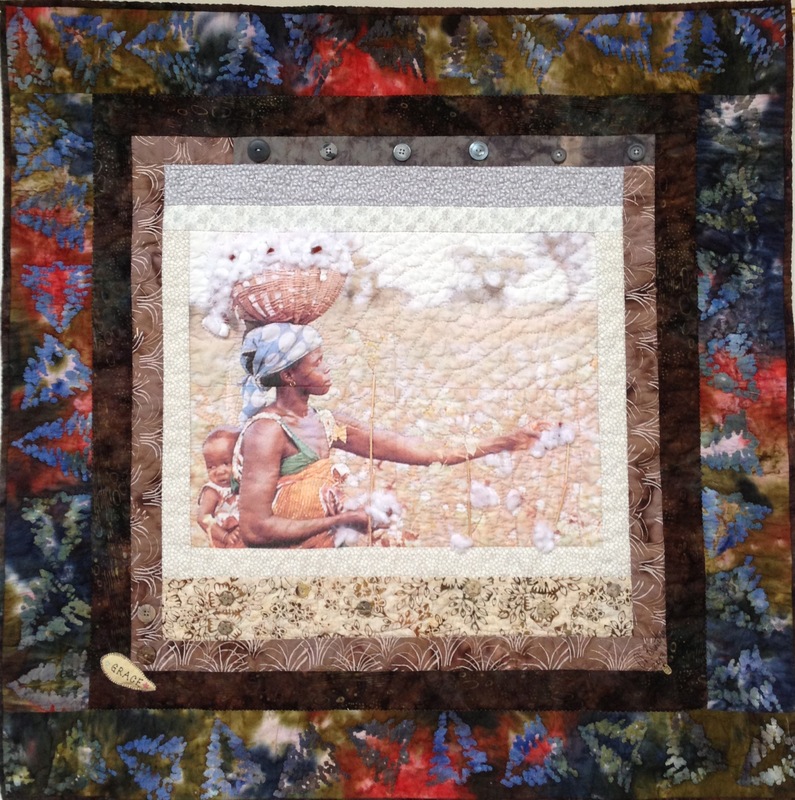 My quilt Give Yourself Flowers Growing Free is part of the 2015 Atlanta Quilt Festival exhibit at South Fulton Arts Center through August 31, 2015. Visit the center located at 4645 Butner Road, College Park, GA Monday through Saturday from 10 – 4 p.m. to see this quilt in person. It is listed for sale in my ETSY Studio store. My quilt Christmas Shopping is part of the 2015 Atlanta Quilt Festival exhibit at South Fulton Arts Center through August 31, 2015. Visit the center located at 4645 Butner Road, College Park, GA Monday through Saturday from 10 – 4 p.m. to see this quilt in person. It is listed for sale in my ETSY Studio store. 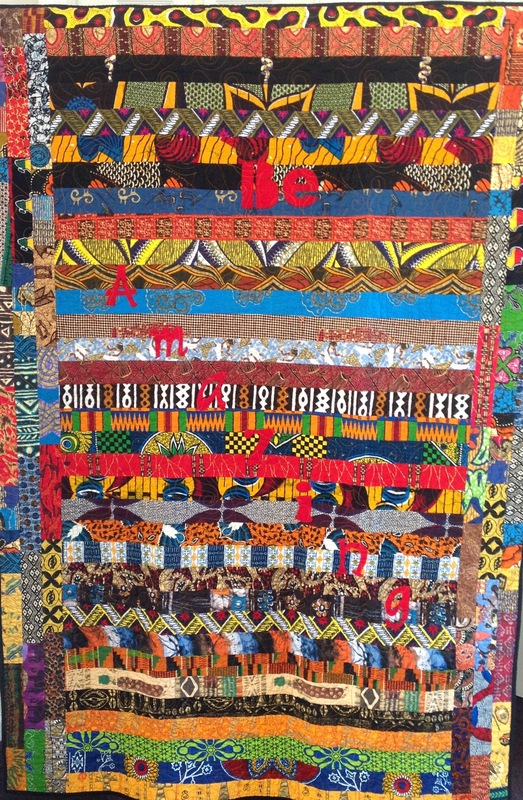 Be Amazing, 45 x 63 inch art quilt, by O.V. Brantley, 2012. My quilt Be Amazing has been donated to the Georgia Association of Black Women Attorneys (GABWA) to aid fundraising efforts for their scholarship fund. It will be auctioned at their annual Glitter Gala July 25, 2015. If you are attending, bid high and bid often! To see other quilts in my “BE” series, visit my Etsy Studio Store. Here’s the link www.etsy.com/shop/ovbrantleyquilts. I grew up happy in a small town. My Mama had everything to do with that. Evora’s Earth is one of the first quilts I made when I began quilting. It honors my Mama and the values she taught my sisters and me. I hope today is a day for happy memories for you as well. Have you planned a vacation yet? I try to take at least two vacations every year, but when I can’t, retreating to my quilt studio is just as good. The quilt shown above may look like a scrap quilt, but it includes all the things that make me happy — Christmas, travel, my sewing machine, coffee, books, to name a few. I named it Quilt Around the World. Welcome To the World Stella Monroe Hazel! Welcome to the World Stella Monroe Hazel, baby quilt by O.V. Brantley, 2015. My newest baby quilt was commissioned for the parents of Stella Monroe Hazel. It was commissioned by Judge Patsy Porter. 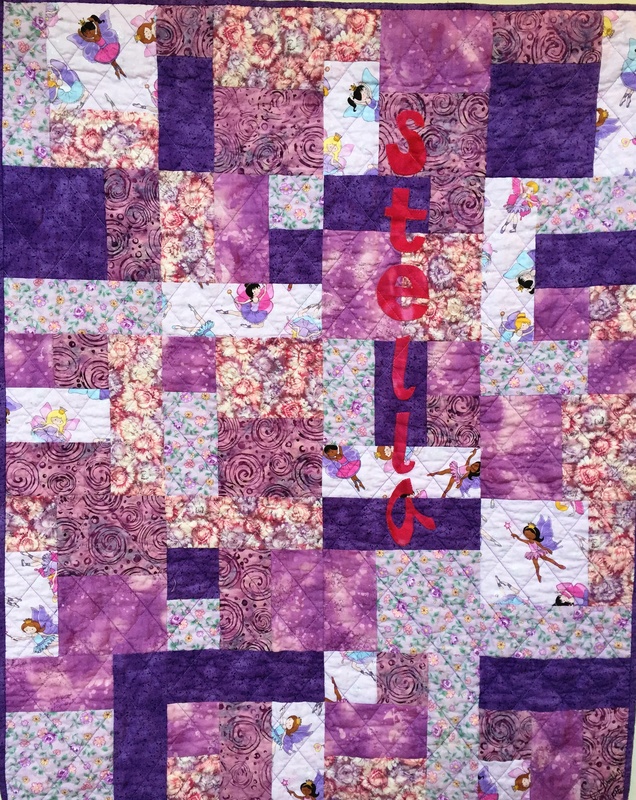 I figured with a name like Stella, the quilt had to be purple! My quilt Choose To Bloom was awarded an Honorable Mention Ribbon in the Traditional Category at Quiltfest Savannah. Thank you to the judges wherever you are! I am happy to report that she arrived home safely and is now on loan to the DeKalb County Law Department. I am one of those people who cannot start the day without coffee. This quilt is called After My Coffee. This quilt may inspire a series because I have many thoughts about what I can do after my coffee. For now, I just want to wake up! After My Coffee is listed for sale in my Etsy Studio Store. I have seen some people who can do Michael Jackson better than Michael Jackson. While it is amusing to see how close a copycat can come to the real thing, being a copycat really doesn’t get you very far in life. People pay for the original. Whatever you are doing today, add your own authentic touch to it. People will respect you for that. The latest quilt in my ‘Be” series is called simply Be You. It is hand quilted to capture the imperfection that is me. Be You is listed for sale in my ETSY Studio Store. It is the seventh quilt in the series. Others are Be Amazing, Be Stronger, Be Fearless, Be Bossy, Be Calm and Be Brilliant. Summer’s End Dreams, 65 x 78 inch lap quilt by O.V. Brantley, 2014. I finished piecing Summer’s End Dreams on Labor Day. I was feeling sad that summer was ending, but I knew I could capture the summer permanently with this beautiful quilt. This week in Atlanta, we are experiencing really cold temperatures. It seemed like a good time to share this quilt. I listed it for sale in my ETSY Studio Store, but it sold within hours. The new owner was kind enough to allow me to hold on to it until after I shared it with my quilting sisters in the Brown Sugar Stitchers Quilt Guild. Monday, Summer’s End Dreams will be shipped to its new owner in California. Summer’s End Dreams back view. Hot Chocolate, 35 x 48 inch quilt, by O.V. Brantley, 2008. I was prepared for the snow that did not arrive in Atlanta. Like many of my neighbors in Publix Sunday, I bought firewood, milk and bread, batteries and bottled water. Oh well, waiting for snow was a good excuse to curl up with a cup of hot chocolate and be lazy. In Atlanta we don’t get snow often, but when we do, we treat it like a holiday. We close the schools. We stay home from work. The city shuts down and we play. Since we always hope for a white Christmas, but seldom get it, the words “Merry Christmas” are quilted throughout the quilt. This quilt is called Atlanta Snow Day. The cure for despair is to dream. Make sure you Dream Like Crazy. Please visit my new site at ovbrantleyquiltstudio.com. My life overflows with blessings. I am trying to acknowledge each one them.